Refers to the heart, liver, and gizzard of domesticated poultry and game birds. Sometimes the neck is also considered to be in this group. 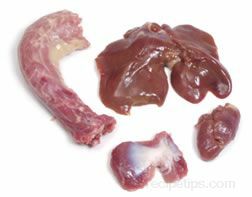 All giblets except the liver are commonly used for flavoring stocks, soups, and gravies. The liver is usually cooked as a separate item and in some cases it is considered a delicacy.